Since long before television, radio, movies, video games or the Internet, people have been entertaining themselves by playing chamber music together. In this presentation by the Spectrum Duo, kids will learn about the violin and the piano, melody and harmony, and how musicians cooperate and have fun while they play the “team sport” of chamber music. This presentation features violinist Vivienne Venderley and pianist Robert Sacks. Through playing and words, drawing on their many years of teaching and performing experience, they demonstrate both the treasure trove of the classical repertoire and the pleasures and challenges of making music together. 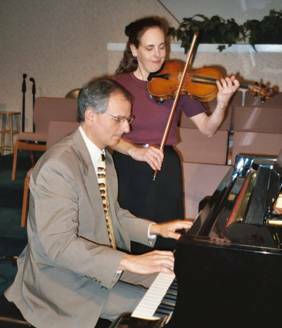 As private teachers, performers, lecturers, and contest adjudicators, Ms. Venderley and Mr. Sacks have been contributing to the musical life of Naperville, Illinois since 1987. They have been playing chamber music together for nearly 20 years, much of that time with the Spectrum Trio. Vivienne Venderley is a graduate of Oberlin Conservatory of Music and has long been the concertmaster of the Fox Valley Symphony. Robert Sacks holds degrees from the Peabody Conservatory and Syracuse University. An active accompanist, he also has published articles on musical subjects.